Our extended Featured Product Friday sale ends this Sunday! 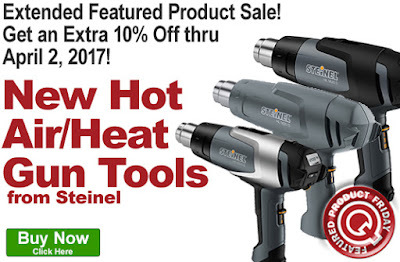 Save an extra 10% off the Q Source price of New Steinel Hot Air/Heat Gun Tools. Our FPF032417 Coupon Code is auto applied when you add an eligible heat tool to your shopping cart. This Featured Product Friday (FPF) promo is now valid thru Sunday, April 2, 2017 and the code is unlimited use. These new heat tools from Steinel are high-quality, long-lasting tools with a variety of operating wattages, variable temperature adjustments, multiple airflow settings, and other professional settings. They are perfect for a number of applications such as heat shrink, welding, paint stripping, and many others. Click here to shop or, for further questions about Featured Product Friday, please read our informational blog post, call us (800-966-6020), or send us an email. Please note: This promo is valid only at QSource.com and now expires on April 2, 2017. Leading off this week’s column: Workrite Ergonomics starts us off with an innovation to a beloved toy from our youth, Nimuno Loops is a flexible tape that turns anything into a Lego block. 3M’s illuminating post reveals that fluorescence, luminescence & retroreflectivity touch our lives in more way than we’d imagine. This may sound like the plot to an old B movie, but Agilent Technologies’ post about the cancer-killing potential of a deadly form of algae seems very promising. Can our modern electrical grid survive a solar storm? Read this National Nuclear Security Administration post to learn how labs like theirs are preparing for such a potentially crippling event. In one of their “3D Printing, The Next Five Years” posts, 3D Printing Industry presents Professor Joshua Pearce’s thoughts on how 3D printing for the home will grow and lead to rich, full, and equitable lives for all of us. We’ve extended our Featured Product Friday sale for another week! Save an extra 10% off the Q Source price of New Steinel Hot Air/Heat Gun Tools. Our FPF032417 Coupon Code is auto applied when you add an eligible heat tool to your shopping cart. This Featured Product Friday (FPF) promo is now valid thru Sunday, April 2, 2017 and the code is unlimited use. Click here to shop, or for further details about Featured Product Friday, please read our informational blog post, call us (800-966-6020), or send us an email. Please note: This promo is valid only at QSource.com and now expires on April 2, 2017. 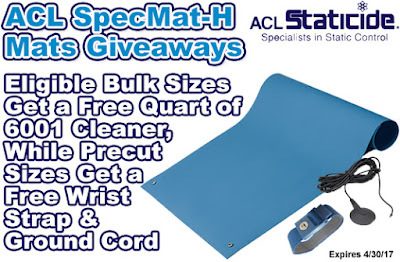 Get FREE giveaways with the purchase of ACL Staticide’s SpecMat-H bulk and pre-cut mats. 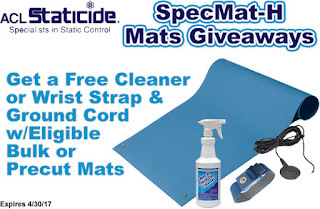 Our Q Source-exclusive, limited-time promo gives you a FREE quart of ACL 6001 Cleaner with the purchase of select bulk size SpecMat-H Mats or a FREE wrist strap & ground cord with a precut size mat purchase. This limited-time offer runs through April 30, 2017. SpecMat-H Mats have a static-dissipative homogeneous single-layer work surface, which is an ESD-safe, thermoplastic vinyl that is inherently dissipative throughout. These US-made mats have a soft textured surface, which offers comfortable protection against static discharge, parts slippage, and damage from UV lights. The SpecMat-H material is very durable and resistant against solder, heat, and most common solvents. When you add one of these promo-eligible mats to your shopping cart, the FREE giveaway items will be automatically included with your order. The FREE items included with these promos include the Model 8090 10 mm Low-Profile Mat Ground 10’ Cord, the Model WS-1050 Blue Economy Wrist Strap & 6’ Coil Cord, and the Model 6001 Staticide® Mat & Table Top Cleaner. Please visit our ACL FREE Giveaways page to purchase your SpecMat-H Mats or to get further info about our exclusive promo. You may also contact us by phone (800-966-6020), email, or via our Web site. Leading off this week’s column: Is your kitchen a sanctuary? GelPro’s post recommends kicking off your shoes and having fun in the kitchen. This Robot Plaza post wonders if home-based robots are ready to move beyond entertainment value to become functional contributors of the household. What is driving the Connected Car revolution? 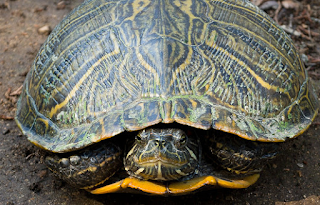 TE Connectivity’s post focuses on safety, clean energy, and the connected lifestyle. If your business has a lot of older workers, this EHS Today post is a good read to learn how engagement will improve these employees’ safety, ergonomics, and productivity. 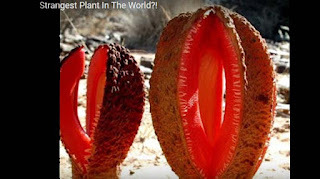 Looking like something from the 1960s’ “Lost In Space” show (and smelling like something left over from that decade, Laughing Squid examines the Hydnora africana plant. 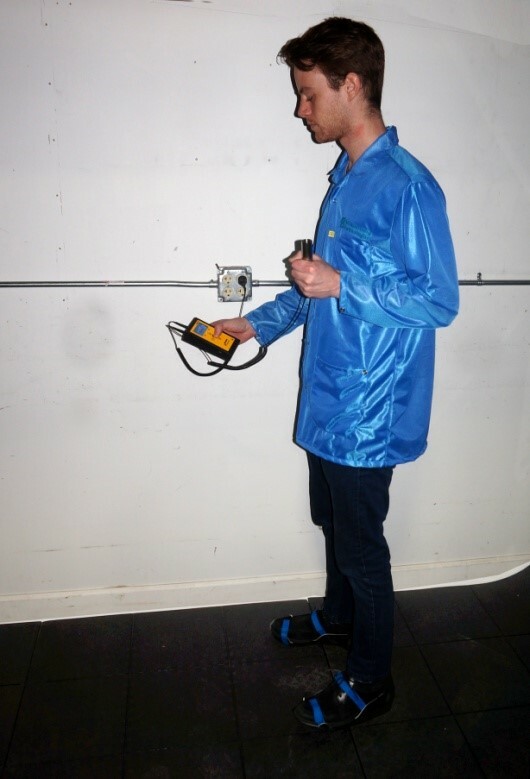 Craig’s latest Q Source Resource Guest Blog looks at how a Walking Voltage Test reveals how well your ESD flooring & footwear system is working. The ESD flooring and footwear system is an effective way to ground people that need to be on the move in a factory. ESD footwear, when worn properly, is designed to drain the voltage from a person to the floor and then to ground. Periodic testing of both the floor and the footwear is required to verify proper functioning. Until recently, a System Resistance Test (ANSI/ESD STM97.1) was all that was needed to qualify an ESD control flooring and footwear system. If the resistance was less than 35 megohms, it was assumed that the person’s voltage would not exceed 100 volts (the upper limit for ANSI/ESD S20.20). However, this testing is done with the person stationary and having both feet flat on the ground. 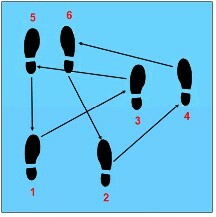 What happens when the person starts moving and the entire foot is not making contact with the floor? 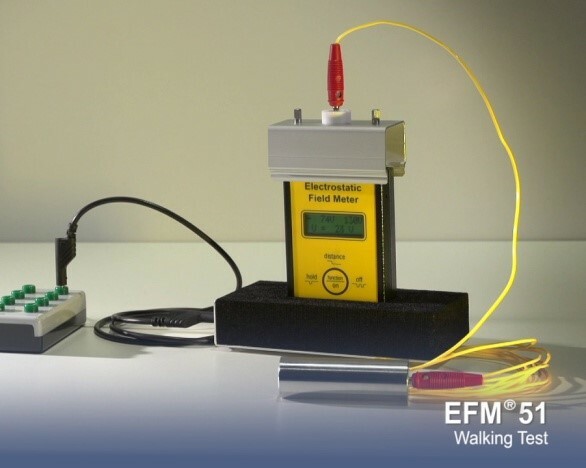 The most recent version of ANSI/ESD S20.20 now requires a Walking Voltage Test (ANSI/ESD STM97.2) be performed when qualifying flooring and footwear systems. 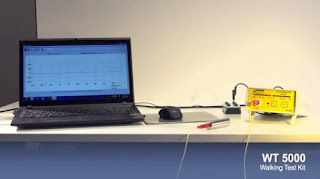 The test consists of measuring body voltage generated during a six-step pattern used to simulate moving throughout a facility. This test will determine the actual voltage on the person while moving. Research has shown that when tested separately, ESD floors and footwear systems may pass the resistance test, but when used together, can greatly exceed the 100-volt threshold. Determining the maximum voltage generated by people moving on the factory floor is very valuable information. By knowing the maximum voltage generated you will know that your flooring and footwear investment is performing as designed. You may also be pleasantly surprised to find out that the system is working quite well and you are able to handle devices with much lower Human-Body Model (HBM) damage thresholds. Equipment is available to accurately measure and record the walking voltage. One such instrument is the WT5000. The WT5000 Walking Test Kit (Warmbier WT5000 Electrometer Walking Test Kit) measures and records the walking voltage while providing a graphical readout. The instrument connects to a PC using any Windows version for easy data collection. The WT5000 identifies the peak voltages per the requirements in the standards. The two-in-one EFM51WT (Transforming Technologies 7100.EFM51.WT Warmbier EFM51WT Field Meter Walking Test Kit) meter holds the PEAK value of the measured body voltage, as well as the LIVE static voltage measured on the operator’s body. The kit includes the EFM51 static field meter, walking test adapter plate, hand probe and conductive carrying case. The EFM51 is a fully functional field meter that, in addition to the Walking Test, measures and detects electrostatic fields, surface potentials, and discharge times (with optional charge plate accessory (part number 7100.EFM51.CPS.SET). You have made the investment in an ESD flooring and footwear system so that people can be mobile while still protecting your products from ESD events. Determining your actual walking voltage generated is critical to knowing that your products are being protected. CLOSING: Thanks, Craig! We appreciate you filling us in about the necessity of Walking Voltage Tests to ensure proper ESD protection for flooring and footwear systems. 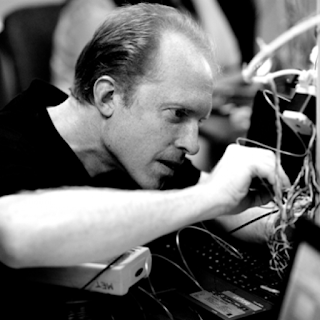 Your expertise is invaluable to our Q Source community. For information about Transforming Technologies and their ESD control/monitoring products (including walking test kits), please visit QSource.com. 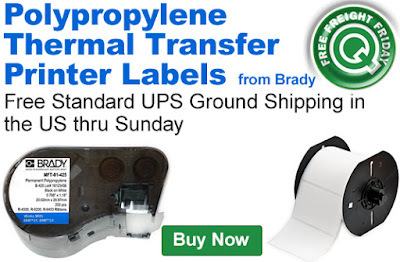 PLEASE NOTE: Q Source is currently running a Free Shipping promo on Transforming Technologies Warmbier Walking Test Kits. You may also contact us via email or phone at 800-966-6020 and we will be happy to assist you. 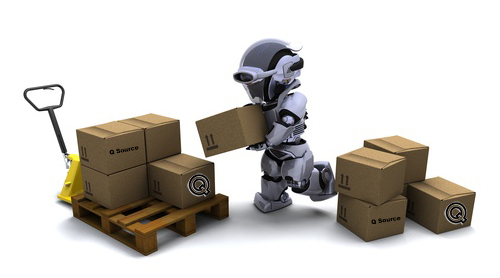 Q Source is open for business today, but orders shipping from our NY office will experience a shipping delay due to the winter storm moving through our area on Tuesday (orders shipping directly from our manufacturers should be unaffected). Our normal warehouse operations should resume on Wednesday, March 15, 2017. We apologize for any inconvenience. If you have questions about your order, please utilize our live chat feature at QSource.com, email us, or call us at 800-966-6020. You can also refer to our blog and social media posts for further info and, as always, our Web site is available 24/7 for your orders and inquiries. Please be safe and stay warm if you are also in the area being impacted by this potentially dangerous winter storm. Happy shoveling! 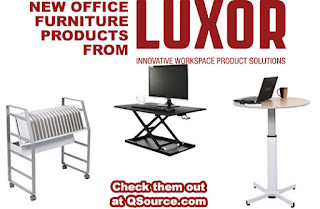 We’re here to tell you about a variety of new mobile/adjustable office furniture products from Luxor. So, step up to the lectern and gather around the round table because whatever your furniture need, you’re sure to find a modern, professionally designed solution among these new tables, carts & desks. These new selections from Luxor are perfect for a variety of environments such as offices, conference & training areas, schools/classrooms, restaurants, tradeshows, and social settings. And most of them are mobile to allow you to move them to wherever they are needed. Please visit our Luxor New Products page to make a purchase or for further information. You may also contact us by phone (800-966-6020), email, or via our Web site. If you don’t find what you’re looking for from the new selections above, please visit our main Luxor page. Leading off this week’s column: We found this IDEAL Electrical retweet about women in electrical contracting to be quite enlightening. We’re always interested in passing on skill-building how-to info and tutorials. Here’s a retweet post from Weller that offers some hot techniques for professional SMT soldering. Have you ever heard of Rebecca Davis Lee Crumpler? Check out Agilent Technologies’ post about this groundbreaker who was America’s first black female doctor. TE Connectivity retweeted this look at how the “last mile” of transit fits into the plans for the next generation of personal mobility. Are you too busy to get to your reading list of classic books? 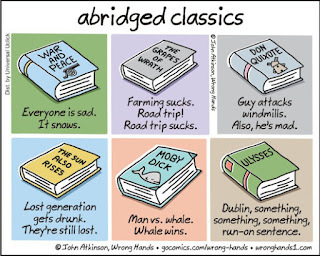 Get a head start (and some laughs) with Laughing Squid’s post of extremely abridged versions of classic books. 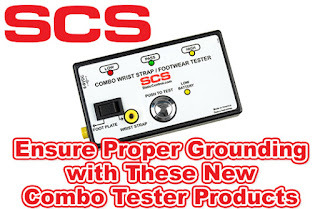 And we close out this week’s column with our post about SCS’ newest tools for personal grounding protection. 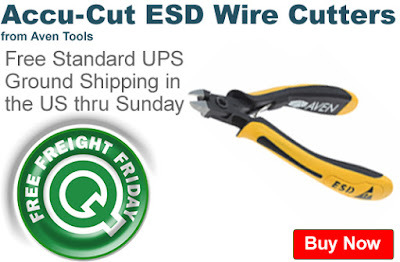 Save shipping costs on Aven Tools Accu-Cut Wire Cutters. 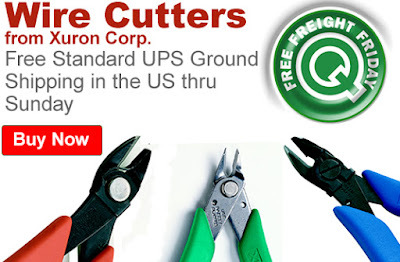 Get Free standard UPS Ground shipping in the US when you add eligible wire cutters to your shopping cart. Our Free Freight Friday (FFF) promo is valid March 3, 2017 and runs through Sunday, March 5, 2017. These wire cutters are strong (a hardness of 63-65 HRC), versatile, long lasting and feature superior cutting edge technology (a unique joint design ensures that the cutting edges stay in alignment) making them perfect for many applications. Click here to shop for Aven Tools Wire Cutters. For further questions, call us (800-966-6020), or send us an email. Please note: This promo is valid only at QSource.com and expires on March 5, 2017.